My name is "Gert" Worthington, at least that is the name I prefer to go by instead of Ethel, Gertrude, or Gertie. My story is similar to many women who remained in the household to care for an aging parent. Our family farmed lot 18, front concession 7 with the Hugh Cassin family and the Moses Byrne family our neighbours on either side. Father bought the farm in 1877 from David Stirton who had in turn purchased it from the Kenneth McKenzie family who, along with John McLean of Puslinch, were among the first to settle in Manitoba before it became a province in 1870. My sister Jossie and I were born after the family moved here. Some of you may have known Jossie. She married James Tawse and the stone house on their farm became the ‘Ten Mile House' art gallery in the 1970s. It was eventually torn down for the Nicholas Beaver Industrial Park. My father was John Worthington Jr., son of John Sr. and his wife Mary Ann of E. Flamborough Township. My mother was Almira Case, daughter of John and Elizabeth Case of W. Flamborough Township. The senior Worthingtons had emigrated from Lancashire, England and married in Dundas in 1826. The Cases, of German extraction, came into Upper Canada from Pennsylvania via Niagara in 1797. I was the youngest of 12 children. My second-oldest sister Mary Elizabeth ("Bessie") had married Thomas Ingram from the farm directly behind us. Ingram's Inn was on lot 18, r. 7 – the east side of Brock Rd., north of Aberfoyle. I was only an infant when Bessie died of appendicitis while picnicking with their 3 children at the mill pond in Aberfoyle in 1884. She left 3 children ages 5 and under. Tom Ingram remarried and continued as auctioneer and bailiff in the Aberfoyle area for several years. His second wife died in 1891, just two years after their marriage. He stayed on in the house, but at this point the children went to live with other family members so he could continue with his business as an auctioneer. My mother was devastated by her daughter Bessie's death at age 26. Then in 1889, my mother died at age 51. I was only 5 when she died and didn't know that my father being left a widower would affect my life in particular in the future. Father was in his early 60s when Bessie and Tom's son Corm Ingram came to live at the farm, joining those of us still at home. My nephew Corm was the same age as I was. By 1901, my sister Clara and her husband Adam John King were running the farm. Father was 81 and I was the only daughter unmarried by that time. We continued to live on the farm where I was caring for my aging father. While single, that didn't keep me at home. I took part in many community activities like musical presentations and garden parties. In 1907 I passed my piano examination at the Toronto Conservatory of Music, a student of Mrs. Gardiner Harvey who was the organist of St. George's Anglican Church in Guelph for 36 years. I decided to become a music teacher to help give me some independence. 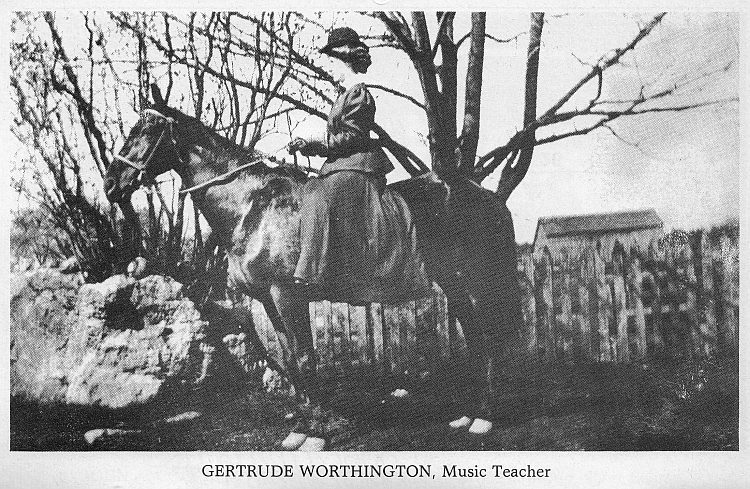 I taught piano and voice to the children in the Aberfoyle area, travelling on horseback to their homes in the village or on farms thereabouts. In about 1910, the John A. Ord family photographed me when I arrived at their farm on the northwest edge of the village to teach their children. When harvest time came, I didn't mind helping John and Clara in the fields either. After Father died in 1913, they decided to sell the farm and they moved into a stone house in Aberfoyle where Clara ran a tea room that was a popular spot seven months of the year, especially on fall fair day. The fair was held in late October then, and that would be my closing weekend for the season. The house had belonged to our sister Bessie and brother-in-law Tom Ingram before John and Clara bought it. Our older sister Bessie (Mary Elizabeth) had died so young. You would know it as the stone house the Owens lived in much later on the SE corner on old Hwy. 6 and Cockburn Street. They converted the Aberfoyle Mill into a restaurant and started the Flea Market. The people who live in the Ingram/King house today were given the sign from my sister Clara's tea room recently by Glen Leachman whose father had stored it in their barn for years. It hangs in the shed that is now an antiques shop behind the house. I continued to teach music and organized a young people's musical club that gave many recitals in the town hall in Aberfoyle. An article in the Guelph Mercury on Friday, October 2, 1908 listed the names of 25 young performers at one of these concerts. I was active in the Aberfoyle United Church all my life where I played the pump organ. The Worthingtons attended there since arriving in Puslinch in 1877 when it was a Methodist congregation until the 1925 union forming the United Church of Canada. With both of my parents gone, I often visited friends and relatives in Flamborough. My mother's brother, Uncle Isaac Case, still farmed in W. Flamborough, two of my Worthington uncles were wagon makers in Millgrove, another farmed in E. Flamborough, and two of my Worthington aunts had married Flamborough farmers. The Case, Green, Surerus and Tunis families – all early Flamborough settlers – lived on neighbouring farms. I had known Tom Surerus for years from visits to family. My husband's full name was Thomas Everett Surerus and he had been farming with his father on the farm where he was raised in W. Flamborough. We were both 41 when we decided to marry in March of 1925. Tom bought part lot 22, f. conc. 8, which is located between Aberfoyle School and the Mill Pond today, so I was living near my sister Clara and her family. As you can see by our stone, I died in 1945. My nephew Thomas Cormack Ingram ("Corm") who had grown up with me came from Toronto to be a pall bearer at my funeral. A few years after my death at age 62 Tom decided to sell his farm in Aberfoyle. He eventually moved back to Wentworth County. Tom outlived me by 25 years. He died in Hamilton in 1968 in his 85th year, and is also buried here. Our farm became home to newly-married Don and Helen, nee Greer, Schwartz. They eventually took down the old farmhouse and built a very modern home on its site. Helen too, taught piano to many pupils in the Aberfoyle area. While my marriage came later in life, my music students provided me with a full and independent lifestyle. I know that the young people's musical talents lived on for many years in the memories of the older members of the Puslinch community.